The Marina District glimmers for a number of reasons other than its priceless view of the Golden Gate Bridge. The neighborhood attracts heavy traffic from residents and tourists, not only for its postcard views but also for its tasty shopping array. We recently visited three recent additions to the area. Started by sisters Olivia and Jillian Walton in Ukiah and Santa Rosa, the latest Liv Fashion Boutique sits on Fillmore Street — technically in Cow Hollow, but still worth a mention here. At the Fillmore Street location, what once was a furniture showroom is now a space that stretches down a ramp deep into the back, where natural light infuses the dressing rooms. It’s the best light to really see fabric colors against your skin. Near the entrance rests a table of denim in a variety of options in cut, wash, and price. Labels include Rock Revival and Big Star 1974, with prices starting at $69. To top off these bottoms, Liv Fashions offers a number of basic cami slips ($34) and tube tops ($15) in bold primaries or simple neutrals. The Walton sisters culled a number of trendy pieces from Los Angeles. The looks and prices make this boutique a fashion destination. Some standouts include a floral romper ($54) and a pink chiffon pleated dress ($68). Aside from delicate feminine looks, Liv also offers a variety of styles, such as strong graphics on an asymmetrical dress ($84) and a mustard cable-knit sweater ($54). Nearby on Chestnut Street, Heritage Row opened in August 2010. Jenny France, the owner, stocks flirty looks from a wide range of lines including BB Dakota, Line Dot, Mink Pink, and Funktional. Consider the white maxi dress ($120) by Line Dot — it’s scattered with tiny purple flowers as if the shore winds blew in a bouquet of flowers. Another flirty and classy alternative is a sleeveless wrap polka dress by Aryn K ($124). It’s a bargain considering the polka-dot pattern is a huge print for this fall. For more casual options, Heritage Row offers interesting knits, such as a heather sweater by BB Dakota ($94). It’s set with different gauges so it pulls in some areas and gives in other areas. The look is refreshingly inventive compared to a standard ribbed or cabled knit. Don’t miss the stairs to an alcove of bargains. Some great finds include a black sequined blazer (on sale for $155) with a cut-out back by Mink Pink. Another great evening cover-up is a deep blue velvet blazer ($128) by Funktional. It’s aptly named the Pow Wow blazer for its punch of color. 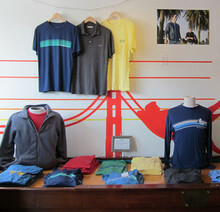 Also on Chestnut Street, Marine Layer opened in September 2010 with an “absurdly soft shirt” in many cuts, colors, designs ,and styles for men and women. Everything here is pre-shrunk 100 percent cotton. There are even modified sizes like Marge, a hybrid of medium-large), and onesies were just added to the collection. The designer, Mike Natenshon, set up shop when his girlfriend threw out his favorite tee. Natenshon replaced that beloved tee with hundreds of them. His business plan is to create limited designs every two weeks. Only 50 of each design is put into production and that design officially retires once the last piece sells. Tees start at $35, tanks $29, and fleecewear $60. These recent shopping additions are in the heart of the Marina, and well worth the time to stop and shop. Although all three offer their own unique collections and styles, they do have one important thing in common: The cost of the merchandise helps the shopping dollars stretch just a little farther than usual.